Now that winter has finally arrived in Northeast Ohio I’ve decided to revisit a scene that excited photographers in the Cleveland area in December of 2010. The frozen lighthouse was photographed by just about every photographer in the area and was picked up by the national media and shown on TVs throughout the world! Along with other photographers I went down to shoot it several times, once a low contrast dreary day and then a few days later in the bright sunshine. I was even interviewed by one of the local TV news crews while shooting it. They were laying in wait for a photographer to come along on the first day and apparently I was the first to arrive while they were there! I posted a beautiful shot of the lighthouse on my Kolman Rosenberg Photography Facebook page a few months prior to starting this blog and won’t post it again here because it is so similar to hundreds of shots taken by other photographers and if there’s one thing I hate, it’s having a shot that everyone else has as well! Here’s a shot of another photographer shooting the lighthouse and I like the angle and location it was shot from. Different than most! 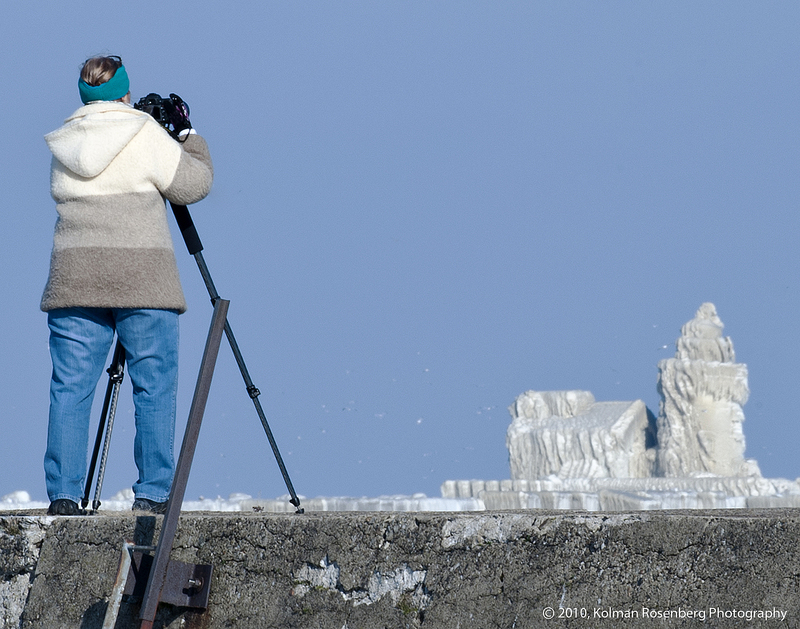 A local photographer shooting Cleveland's frozen lighthouse in December 2010. So, in order to post something a little different, I played around with my original posted photo of the lighthouse and came up with a different effect. Others have done this as well, but at least it’s not as common a photo. 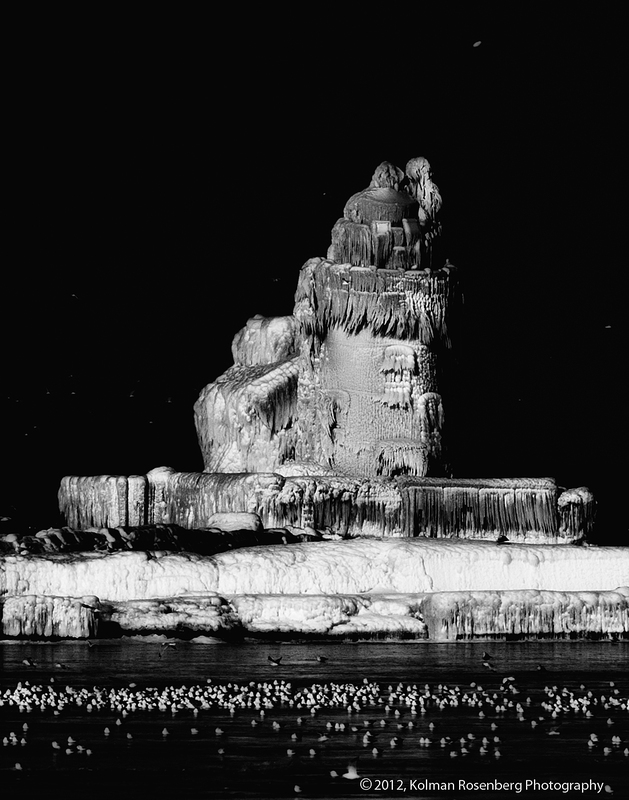 Cleveland's frozen lighthouse as it might have appeared at night. This version was created from the original daylight scene to simulate a night shot and is just as striking, maybe even more so! Ahh for the magic of image editing software! This entry was posted in Uncategorized and tagged Adobe, Cleveland, editing, Frozen, infrared, Lake Erie, lighthouse, Nik Software, northeast, OH, ohio, photoshop, software. Bookmark the permalink. Hi Kolman, I love your simulated night version of this. As you said, we ALL have shots of this from last year during the day, I am no exception. It is something we may never again see in our lifetime. My friend that are out of state enjoyed the image. Anyway, yours is the FIRST I have seen taken to new heights via editing. Nicely done. I also like you shot of the photographer and the composition you have is perfect, except for one thing…it’s not me :-(. Happy New Year and thanks for continuing to share your views with all of us! Thanks for the kind comments Michele! Right after I was interviewed by the TV station they interviewed a Coast Guardsman who said that as far as he knew, this had never happened before, so I don’t doubt that we may never see this sight again! Funny thing is that every time I look at the shot of the photographer shooting the lighthouse I think it could be you, though I know it wasn’t!